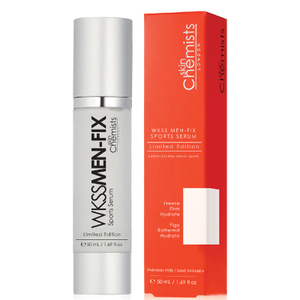 Hydrate and revitalise skin with the Wrinkle Killer Snake Serum (WKSS) Men Sports Serum in a Limited Edition from skinChemists. Suitable for daily use, the powerful anti-ageing treatment helps reduce the appearance of fine lines whilst moisturising dry and dull complexions. The active ingredient Syn-Akle, a potent peptide, mimics the effects of snake venom to painlessly prevent muscle contractions. Concentrated spheres of the peptide work to freeze, firm and hydrate skin as well as prevent the appearance of fine lines. Hyaluronic Acid firms and tones skin by encouraging cell renewal, whilst Evermat aims to help reduce visible pores and minimise shine. Skin is left smooth, soft and mattified. Aqua (Water), Glycerin, Triethalolamine, Carbomer, Butylene Glycol, Benzyl Alcohol, Borago Officinalis (Starflower) Seed Oil, PEG-7 Glyceryl Cocoate, Allantoin, Phenoxyethanol, Sodium Hyaluronate, Disodium EDTA, Dehydroacetic Acid, Ethylhexylglycerin, Dipeptide Diaminobutyroyl Benzylamide Diacetate, Wheat Amino Acids, Parfum (Fragrance), Aloe Barbadensis Leaf Extract, Benzyl Salicylate, Hexyl Cinnamal, Limonene, Oleanolic Acid, EDTA, Potassium Sorbate.